Compare Solar Connect Samsung Refrigerator. Check out Samsung RT37M5538S8/TL and Samsung RR24M289YU2 price in India with features, ratings, reviews and specifications, top seller prices, reviews, lowest offered price and online deals. You can see list of our Samsung RT37M5538S8 vs Samsung RR24M289YU2 below, perform Side-by-Side comparison. If you need further help, do have a look at Conzumr Guides and Tips. Alternatively you can view all Refrigerator to choose your own favourites. 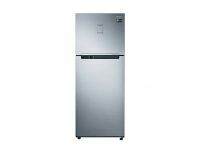 This samsung double door refrigerator has top mount freezer with solar connect. It's capacity of 345 liter. It has digital inverter technology automatically adjusts the compressor speed in response to cooling demand across 7 levels. It uses less energy, minimises noise and reduces wear and tear for longer-lasting performance. This refrigerator comes with high efficiency Led lighting is slimmer, cooler and more power-efficient than conventional lighting. 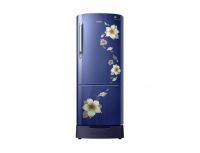 Make sure your fruits and vegetables stay fresh in the Samsung RR24M289YU2 Star Flower Blue Refrigerator, which integrates direct cooling technology. With toughened glass shelves it can hold a weight of up to 150 Kg safely, so even large vegetables, like marrows, or dishes prepared in heavy pots and pans can be kept cool and fresh. Rated at 4 stars, this 230liter 1 door refrigerator is energy-efficient. Multi Air Flow: Multi air flow cooling system it an essential feature in a refrigerator because the multi flow evenly enters over each shelf through small vents and cools every compartment of your fridge. It especially works when you open the door of your fridge to evenly cool each and every part of the fridge. To Recieve updates and possible rewards for Samsung RR24M289YU2 please sign in. To Recieve updates and possible rewards for Refrigerator please sign in.